Little is certain in the world of A Song of Ice and Fire. Lives are ended with a stroke of steel and mighty strongholds are brought crumbling down into ruin by sieging armies. In such a dangerous and changeable landscape, it seems impossible that something as fragile as a dream could long survive. And yet, a dream - of power, or wealth, or love - may be all that keeps the players of the game of thrones moving forward. 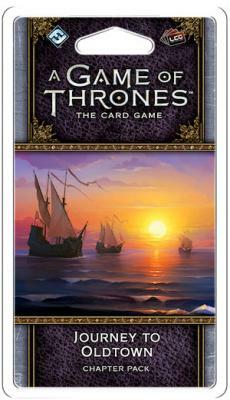 The second Chapter Pack in the Flight of Crows Cycle for A Game of Thrones: The Card Game, Journey to Oldtown continues to follow the major events of A Feast for Crows, bringing new strength to the \'bestow\' keyword and providing incentives for the factions to forge alliances and band together. Along the way, you\'ll encounter a host of iconic characters and locations entering the game, including The House of Black and White, Thoros of Myr, a new version of Arianne Martell, and a lord of House Botley, Tris Botley.